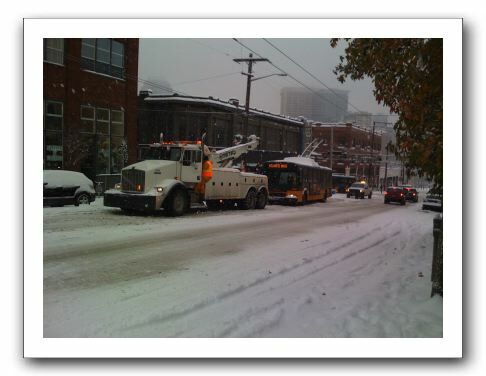 That leaves many drivers, including Seattle police, pretty much on their own until nature does to the snow what the sand can’t: melt it. The city’s patrol cars are rear-wheel drive. And even with tire chains, officers are avoiding hills and responding on foot, according to a West Precinct officer. Anyway, after what seems like a solid ten days of continuous snow, it’s 40F/4C and the snow is melting. Heh. It’s 56F in Chicago. Mmmm…mud! Chicago uses, IMO, too much salt. This is due entirely to Mayor Bilandic becoming ex-Mayor Bilandic when he didn’t respond quickly to a blizzard. The oddity of this is that Streets and San is a well-known patronage haven, so handing out OT would seem a sensible strategy. That said, not using at least sand seems kinda dopey, especially if (unlike Chicago) your terrain is not like a pool table. After all, a hockey rink is hard as hell, but I wouldn’t want to drive on one. I take away from that comment they want their citizens to buy gas-guzzling SUVs as well as to employ methods of ripping apart your roads by the use of chains. Good lord – what is this 1954? In addition – Salt is MORE environmentally friendly than sand since sand fills up creeks and wetlands. Sand is also a royal pain to remove in the spring. Salt is cheaper and there are methods developed to minimize salt getting into creeks and lakes. Well, here in the Netherlands a lot of salt is used in the winter and it is harmful: alongside the highways there are plants growing that normally only live in the dunes along the coast of the salty North-Sea. And the saltless alternative might not be so bad after all: Some years ago I lived some time in Finland. There they didn’t use salt at all, but cleared the roads of loose snow and put grit on the compacted under-layer of snow. No problems at all that way.